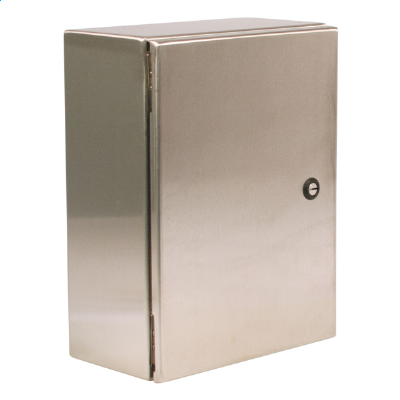 Hubbell Wiegmann N412SSC ULTIMATE Stainless Steel Series Enclosures are designed to house and protect electrical and electronic components from harsh, dirty environments. For use in installations where dirt, dust, oil, water, or other contaminants are present. Itis typically used in the following areas where corrosion-resistant protection is needed: food processing plants, pharmaceutical manufacturing facilities, petrochemical plants, pulp and paper processing, and waste water treatment facilities. Streamlined styling, flush latching, and attractive Stainless Steel finish complement any high tech electronic equipment.